Good Girl Style: Do You Kombucha? Good flavor, LOVE the bottle and design. Unfortunately, this was the most mead-y tasting one, and it never tasted ice COLD to me. I suppose I could have tried it over ice. It was also missing the nice sparkling essence I liked in the others. This one is delicious! I love guava flavoring, but it's not something you see too often (yet). This was light, refreshing, lightly bubbly, and made me feel happy (due in part, I'm sure, to its light pink color!). I don't think these are technically kombucha, though they are certainly based on the same principles, and are delicious. 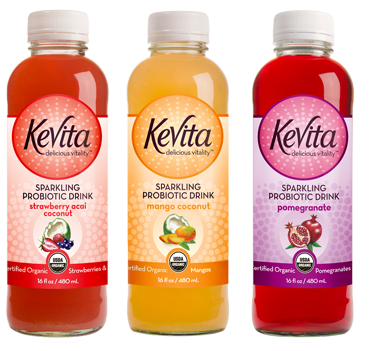 The mango-coconut and strawberry-acai coconut are pretty good, but the Pomegranate is out of this world. The flavor was deep, the color dark, the sparkling quite fizzy, and all-around delicious. I've purchased the pomegranate several times. However, I do caution that it contains apple cider vinegar, so I always like to brush my teeth after I drink it so the acid doesn't kill my enamel. Granted, these drinks are all very expensive and I will say my experiment is probably short-lived because shelling out almost $4 for one bottled drink makes me die a little bit inside. However, I wanted to try it, and should I ever be aching for a fruity, sparkling, slightly vinegar-y drink, I'll reach for the KeVita Sparkling Probiotic Pomegranate (sometimes on sale for a slightly-less-outrageous $2.29). It's definitely discouraging to see the price tag!